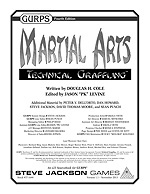 GURPS Martial Arts – Customizing the GURPS combat system has never been easier. e23 offers worldbooks, supplements, and adventures, in digital form, for GURPS – as well as many of our other game lines. Surf our site for the files you want . . . and get them instantly with a credit card or PayPal! This one’s a little early, but +Peter V. Dell’Orto and I again teamed up (see Dire and Terrible Monsters, below) to prove that grappling rules don’t have to be Dire and Terrible. Taking square aim at grappling in D&D-flavored games, this forthcoming article in +Tim Shorts‘ Gothridge Manor takes some of the concepts from Technical Grappling and applies them in as simple a way as we could come up with to the game mechanics found in D&D. While written for Swords & Wizardry, it’s definitely applicable to D&D5 and Pathfinder. Coming Soon (probably late April or early May). A list of articles I’ve published in Pyramid magazine. I suppose one day I might publish elsewhere, but for now, Pyramid is where I roam. Sometimes you need stuff. You don’t know what you need, but in many cases, your character does. You have never been in a 35th century combat zone, but your character has lived in one for six years. When that happens, reach inside Schrodinger’s Backpack to find what you need – but you won’t know if it’s there until you look for it! This article presents an abstract gear system that allows you to choose a weight and cost of “undefined but probably appropriate” stuff, and then draw needed items at will using an appropriate skill. It was designed as a way to shorten the “shopping trip” that can bog down adventure prep, or allow “Crazy Prepared” characters to not require a crazy-prepared player. In order to hit much of anything in combat with firearms that happens at more than arm’s reach, you have to Aim. This is often a fairly boring thing in GURPS – declare it, wait until next turn, and then shoot. Every. Single. Time. On Target spices that up by treating Aim as something you have to not just declare, but do well – a success roll. This one saw actual playtest in several campaigns before publication, and is likely my personal favorite rules modification that I’ve ever written. I hope you enjoy it too! I team up with +Peter V. Dell’Orto to bring terrible whimsy to Dungeon Fantasy games. Following the model previously established, by adding two adjectives (“Dire” and “Terrible”) to a generic animal or monster, you can create a ridiculously up-gunned and surprisingly-nasty (with ridiculously nasty surprises for the PCs in combat). Peter and I had Terribly Dire Fun writing this – especially the example creatures! done By Default. This article reveals the benefits and pitfalls of altering how skills default to attributes. As a side-effect, 15-point Talents probably no longer seem pointless. Technical Grappling added a lot of possibilities to wrestling and ground fighting, with or without weapons. But many grappling “moves” are really chains of maneuvers and techniques that can take a while to do. This article takes common unarmed grappling positions and common combat moves and breaks them down stepwise. What position, posture, and sequence of attacks, maneuvers, and techniques are used to take what you see in the ring – or on the screen – and make it real. I return for round two in Coming to Grips with Realism, a peek behind the scenes of GURPS Martial Arts: Technical Grappling to explain the thought process behind its design decisions and reveal a big chunk of optional rules that were cut for space. Some of these add complexity; others strip down and simplify the system for those who love the concept of Control Points but not the bookkeeping. And who doesn’t love new critical hit and miss tables? The best way to deal with gunshot or blaster wounds is not to get hit in the first place! Find out how to use existing GURPS rules – or add minor optional tweaks – to make dodging, parrying, and blocking more satisfying experiences in your adventures. A look at the feint maneuver from the point of view of making a “real” attack, with lots of options. A reworking of fatigue rules in GURPS, plus a new “short term” type of fatigue called Action Points. A look at how damage and armor are handled in GURPS, and how to tweak ’em out. Reviewed at Jeffro’s Car Wars Blog! A monster reworking (11,000 words!) of how to design bows and crossbows using real-world physics in GURPS. Free sample! My old article on turning real-world ballistic data into GURPS stats. Another free sample! really meant for Third Edition, but breaking down Military Rank into smaller bits for games in which it matters. There’s a mistake: I say: ” First Sergeant and Command Sergeant Major tend to be staff positions, while Master Sergeant and Sergeant Major are line positions.” That’s backwards. My apologies to all the sergeants in the US Army.